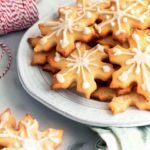 Low carb keto sugar cookies are the most magically delicious way to celebrate the holidays! Super fluffy, extra delicious and guaranteed to make your Grandma proud! Place erythritol, almond flour, baking powder and salt in a large bowl and whisk together to combine. Add melted butter, egg and vanilla extract to the bowl. Using an electric mixer, thoroughly combine. Lay a piece or plastic wrap on your countertop. Place the dough in a ball in the center of the plastic wrap, then press on the top of your dough to form a disk. Place in the fridge for 6 hours - overnight. Roll the dough using a rolling pin between two sheets of parchment paper until the dough becomes 1/4” thick. Use cookie cutters to cut into desired shapes. Form excess dough into a disk and place in the fridge for 20 minutes before rolling/cutting again (this will make it easier to use). Gently place cookies on a cookie sheet (I do this using an super thin spatula) and bake in the center rack of the oven for 7-9 minutes, or until the edges become lightly golden. Allow to cool, the cookies will continue to harden as they cool. Place powdered erythritol in a small bowl. Add water using ¼ teaspoon increments until it’s created a paste. Place into a resealable bag and cut a small hole in the tip. Decorate your cooled cookies and enjoy!